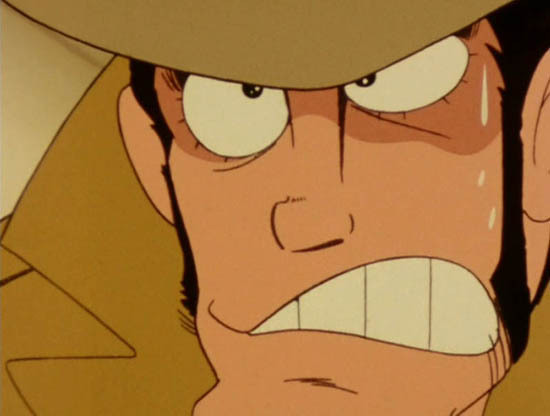 I am saddened to report that once again the entertainment industry has demonstrated its contempt for the rule of law with the release of yet another in a long line of animated serials dealing with the notorious criminal, Lupin the 3rd. 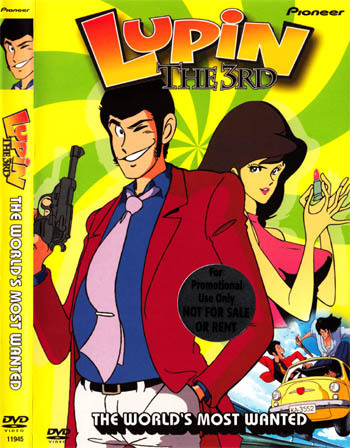 This latest DVD release even has the audacity to poke fun at Lupin’s criminal status with its title “The World’s Most Wanted”. I am shocked at the lack of respect for law that Pioneer, once a highly-regarded entertainment conglomerate, has demonstrated with this video. It was bad enough that these supposedly comical cartoon “adventures” of that reprobate Lupin had been transmitted across the public airwaves during the mid 1970s, but to dredge these accounts of larcenous and immoral behavior from whatever pit of depravity they had been confined to is almost a crime in itself. All of Lupin’s accomplices are fully implicated in the crimes this video depicts. The gangster Jigen, the mercenary swordsman Goemon, and that curvaceous grifter Fujiko are all explicitly shown engaged in violations of the criminal codes of dozens of nations. I am, as always, deeply embarrassed that the corrupt and malicious producers of these animated films have seen fit to include a painfully inept caricature of myself as a character in these shameful episodes. 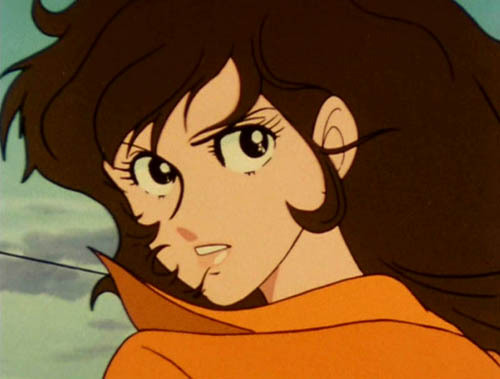 It is a known fact that Lupin III has eluded capture so far - but not for lack of effort on my part, I am proud to say. I only wish the same was true for some of our “brethren in blue”, who seem to regard this brigand as a harmless and entertaining thief rather than a menace to public safety and morals. The six “escapades” contained in this DVD are fanciful recreations of some of Lupin’s most heinous offenses, as produced for Japanese television by the Tokyo Movie Shinsha animation studio. “The Revenge Of Lupin The 3rd” features the destruction of an entire luxury liner, prompted by a madman driven to revenge after becoming the victim of one of Lupin’s previous schemes. In the luridly titled “Buns, Guns, And Fun In The Sun”, Lupin and his gang demonstrate what may be new heights of contempt for civilized society, as they not only rob the box office of Rio’s soccer stadium and make a mockery of the Brazilian penal system (here my opinion of the Rio police matches Lupin’s - I fear the tropical climate and moral lassitude of the inhabitants has contributed to the decline of this law enforcement unit) - but a priceless national landmark is perhaps irreparably damaged by Lupin’s unthinking greed. “50 Ways To Leave Your 50-Foot Lover” is a fanciful tale of the supposed Loch Ness Monster, reportedly tamed by Fujiko’s singing voice. “Gold Smuggling 101” is a primer in perfidy for anyone who wishes to embark on a life of crime. I must say it was ingenious of Lupin to utilize a scheme straight out of the film Goldfinger, but then again, he IS a thief. What disturbs me the most about this episode may be the depiction of the corruption of what was once a respected bank manager; or perhaps it may be the depiction of myself, which literally portrays the author as a myopic crank from whom Lupin is able to escape without effort. I assure you, my failure to permanently apprehend Lupin is a result of the criminal’s inhuman cunning and dexterity, not a lapse of attention from this detective.“Shaky Pisa” is remarkable not only for the earthquake-device that nearly destroys Pisa, but also for expecting the viewer to believe that Lupin the 3rd will retire from the scene while leaving millions of lire un-stolen. In the “Cursed Case Scenario”, the ancient sands of Egypt are befouled by Lupin’s perfidious footsteps. Not even national treasures are safe from his larcenous grasp! Luckily his ill-gotten swag seems to be more trouble than it is worth. The animation of these criminal adventures is of the standard seen on broadcast television in Japan in the mid 1970s; adequate without devolving into primitivism, though bereft of the occasional flashes of artistry seen in other “cartoons” of the period. The depiction of Lupin and his accomplices are realistic enough, though exaggerated for supposedly comic purposes. Other than a garish series title in English, the opening credits are as originally presented, and the end credits are similar to the Japanese, with a rather weak instrumental replacing the original Japanese vocals. Rendering these photoplays into English was obviously an attempt on Pioneer’s part to corrupt the morals of the children of the Western world, already known to be in a precarious state. Lupin’s English voice is remarkably similar to his Japanese. This new Anglophone version, however, is closest of all to the rendition heard in the long-suppressed “Mystery of Mamo” film (though Lupin’s voice was the only point of accuracy in that otherwise scandalously erroneous production. “Ed Scott”, indeed). Both Lupin and his crew of malcontents spout dialog that positively reeks of the disrespectful, flippant attitude that would lead one to a life of crime; puns, insults, and innuendos of a leering nature abound in their speech. I am positive that the intended audience for this low-class banter will find it quite amusing, however disturbing it may be to those of more refined tastes. Seemingly tireless in its mania to promote lawlessness and crime, Pioneer has released this DVD with options of both English and Japanese language tracks. A detailed section of line drawings of characters, devices, and locales acts as a veritable university education in wrongdoing for the interested viewer. Previews for other of Pioneer’s perhaps more law-abiding productions fill the remainder of this digital video disc. In conclusion, let me exhort Interpol to use every means at its disposal to prevent this latest affront to the public dignity. How much longer will law-abiding citizens be forced to endure the glorification of criminality? 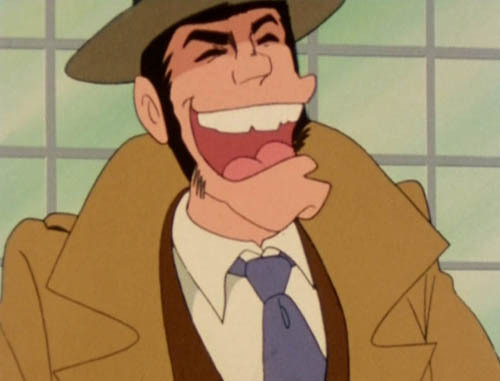 Is Lupin the 3rd the kind of figure we want held up to our children as a figure to be emulated? Already reports are coming in about a new Lupin comic book in America, and the new year will see Lupin’s duplicitous face plastered across the television screens of that already criminal-infested country. I urge you, sirs, to wait no longer. For my part, I have just received information about Lupin’s latest target, and I must end this communication posthaste. Rest assured, gentlemen, that this time I will DEFINITELY bring Lupin the 3rd to long-delayed justice. We like to think of Japanese animation as brilliant world-class entertainment, able to hold its own against the cartoon arts from around the globe. Occasionally that’s the case. But often what we see from Japan is, like the TV cartoons from anywhere else, hastily-assembled, produced on a punishing deadline by stressed-out minimum wage employees, and aimed only at filling a few minutes of broadcast airtime and selling a few ads for toys or candy. It’s this ‘makin’ the donuts’ attitude that’s allowed Japan to produce a prodigious amount of TV animation in the past fifty years, and like anything else, there are flashes of brilliance, stunning failures, and a lot of in-between (and a lot of in-betweening, that’s an animation reference.) Every once in a while, the surging tides of production come up against the shoals of ineptitude, the rocks of budget constraints, and the pillars of “just get it done already”, and we’re served up something that by its very awfulness has mutated into a singular viewing experience that becomes interesting in spite of itself. Something like Mysterious Thief Pride, or as we’d call it, Dr. Zen. 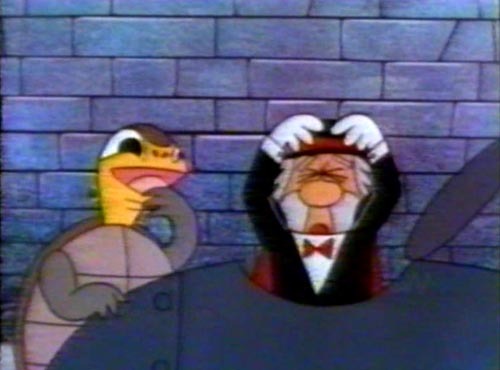 Dr Zen is the world’s greatest thief, and as befitting his criminal status, he dresses like a stage magician in top hat and tails, with a giant mustache flanking his bulbous nose. He flies around in a rocket ship, like all great thieves do, with his assistant Walter, who is a dog. Together they plan the most incredible crimes ever devised, like stealing toys from children and using an enlarging machine to enlarge, say, a toy car, into a real-size car. Because you couldn't steal a regular car, apparently. 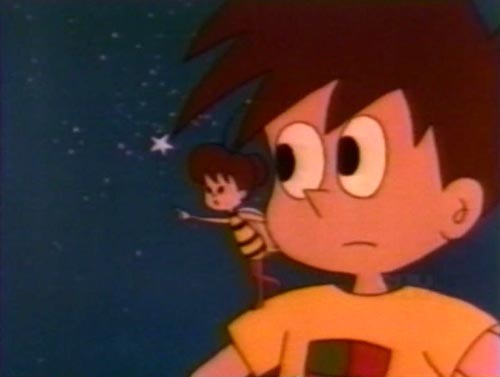 Opposing these dastardly crimes is the young detective Doublecheck, his giant pal Gabby, and their friend Honey, who is a bee with a woman’s head, a horrific nightmare right out of a Vincent Price movie. Meanwhile, the “official” detective Supersnooper bumbles around getting in the way and occasionally having his clothes ripped off. Thus the amazing adventures of Mysterious Thief Pride enthralled Japanese youth in the mid 1960s. 105 5-minute segments of Kaito Pride aka Mysterious Thief Pride were produced by Japan Tele-Cartoons aka Terebi Doga aka TV Films in 1965, perhaps designed to fill that important “rain delay” or “technical difficulties” programming segment of any TV station. Created by Kazuhiko “Panda And The Magic Serpent” Okabe, future stars like Noboru Ishiguro would hone their anime skills on this series. 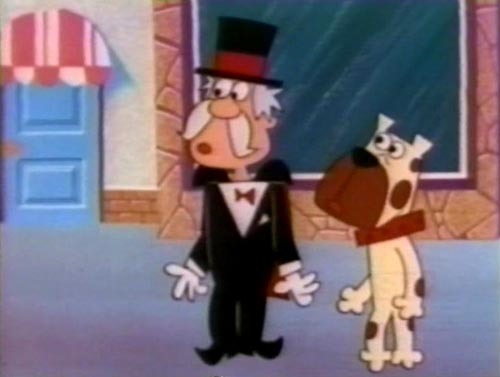 Kaito Pride would likely have remained as unknown to us as many other short-subject anime TV programs like Pinch & Punch or Shadar, but TV Doga knew of America’s hunger for cartoons and thought our good mysterious thief might be a good export. Returned for re-grooving, Kaito Pride emerged in color as Dr. Zen, ready for the American market. But was the American market ready for Dr. Zen? Apparently not; only a few segments of Dr. Zen were produced and it’s unknown if they ever made it to broadcast television. 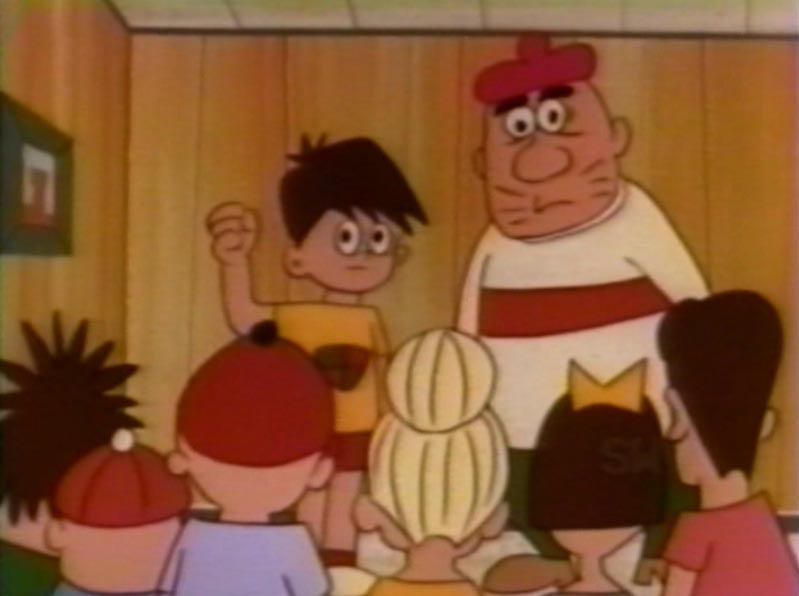 Turns out American syndication, which cheerfully aired drek like Super President, Spunky & Tadpole, and Clutch Cargo, finally found a cartoon they couldn’t use. And I don’t blame them, because Dr. Zen is one hundred percent terrible. The animation is barely there, the character designs seem like they were taken directly from elementary-school sidewalk chalk drawing, and the slow pace of what little story there is makes a five-minute segment feel like that Andy Warhol film of the Empire State Building - and that movie is eight hours long! The narration and voice work hit all the marks - squeaky, raspy, inaudible, comically low, and mumbly. Animation, design, story, and sound, all bad, assemble to make Dr. Zen a difficult viewing experience that pummels the forebrain into submission, a hypnotic, consciousness-lowering ritual that lowers the IQ and suffocates higher mental functions beneath staticky fuzz. This is anime on downers, the cartoon version of a hangover. I cannot imagine the damage this show would inflict upon impressionable young people, and I applaud the good sense of America’s broadcasters in keeping it from our children. a giant turtle laughs at Dr. Zen. No, you're not on drugs. So if it never aired, how did we see it? That’s thanks to Something Weird Video. This cult video distributor is a champion of the forgotten, the sleazy, and the otherwise unmarketable, and is single-handedly responsible not only for keeping the films of Harry Novak and Doris Wishman accessible to the public, but also in releasing compilations of movie trailers, educational films, commercials, and shorts that would otherwise have never seen the light of day. It’s on one of Something Weird’s compilation videos that I first found Dr. Zen, and it is Something Weird we must thank for this, and so much more. It’s with sadness that we note the recent passing of Mike Vraney, Something Weird’s founder, a pioneer in preserving and showcasing the legacy of the offbeat and the exploitative in film. Perhaps giving Dr. Zen to America was one of Something Weird’s lesser accomplishments, but it’s an accomplishment nonetheless. It is Something Weird we must thank for shedding light on one of the mustier corners of Japan’s anime legacy, unleashing Dr. Zen from his 16mm film-can prison and allowing him to run free stealing toys and punishing viewers. Thanks, Something Weird, for proving the low end of Japanese animation can always get a little lower. Dr. Zen will return? I sure hope not.